It’s been called the most polite protest ever, but that doesn’t mean demonstrators in Hong Kong who are demanding that the city-state’sÂ chief executive hands in his resignation, have been timid. While politicians talk behind closed doors, the so-callled “Umbrella Revolution” is rising, bringing more people together under its call for democracy. It began with aÂ week-long student campaign to boycott classes after China announced electoral reforms. The new reforms state that voters would only be allowed to choose from a list of pre-approved candidates for government in the 2017 elections. Hong Kong, which has been under Chinese leadership since 1997 when the British finally relinquished control of one of its last remaining colonies, didnâ€™t take kindly to the news that citizens would be excluded from having free choice in their vote for leadership. 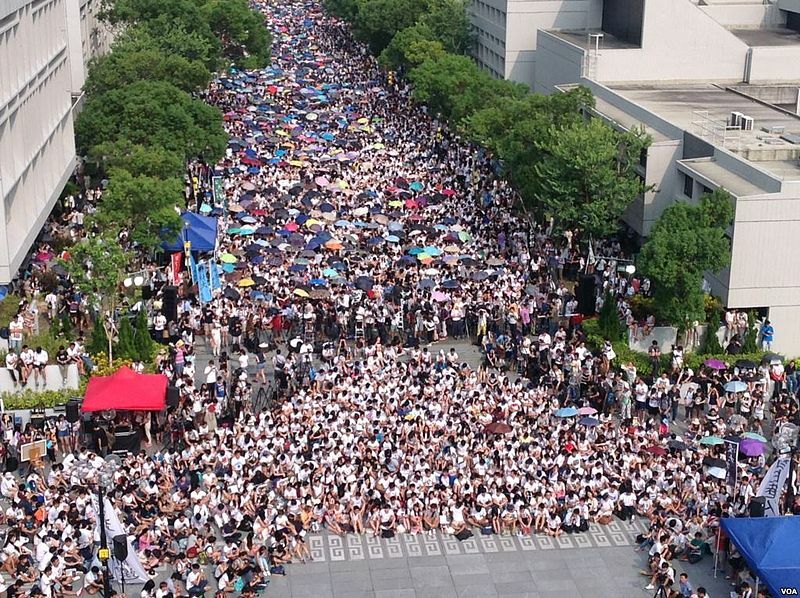 On 22 September, thousands of students joined together in a demonstration organised by theÂ Hong Kong Federation of Students. Initially, they staged sit-ins at the Chinese University of Hong Kong,Â but these eventuallyÂ spilled through onto the streets of Hong Kongâ€™s urban centre in a movement thatâ€™s come to be known as Occupy Central. The occupation of Hong Kongâ€™s business centre has been characterised by singing, picking up rubbish andÂ recyclable waste, scrubbing graffiti from walls and, of course, the carrying of the ubiquitous umbrellas from which the movement would eventually take its name. It appeared that the Hong Kong protests had put the â€œcivilâ€ in â€œcivil disobedienceâ€. The umbrellas originally had a practical purpose – it has rained almost every day since the protests began – but they soon took on a more defensive function as armed police stormed through the protest grounds unleashing teargas on thousands of young protestors. 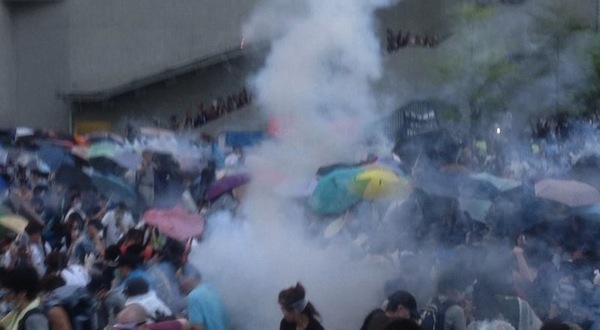 For a few hours on Sunday night, Hong Kong became a war zone and the same umbrellas that demonstrators had used to shelter from the rain were soon being used to protect against teargas and pepper spray. The police, who have backed decades of peaceful protest in Hong Kong, followed Beijingâ€™s orders. Democracy hasnâ€™t come easy, and the media clampdown on the protests is proof of it. Beijing has a lot to worry about, and social media, with its power to spread influence and the image of revolution, is at the forefront of its concerns. Since the protests began, Instagram has been blocked for Chinese users. The student movement has developed into an umbrella movement where people of all ages, cultures, and social background have come together in a single unified call for democracy. On Wednesday, Chinaâ€™s 65thÂ National Day, the crowd continued to swell. Around 10 000 workers joined the rally, and hundreds gathered in New York in solidarity with Hong Kongâ€™s fight. But with the memory of 1989â€™s demonstration in Tiananmen Square, Beijing, still alive, the students are at the center of the movement. Although the Umbrella Revolution has no definitive leaders, students who have positioned themselves in the frontline have said if Leung does not resign, they would occupy government buildings. China has backed Leung, and police have threatened â€œserious consequencesâ€ should demonstrators move forward. The young protestorsÂ believeÂ their futureÂ isÂ at stake;Â life in Hong Kong is a struggle of high costs, low paying 12-hour working days, and increased immigration from Chinaâ€™s mainland. Nobody knows where the protest will go from here, and protestors have hope, but little confidence,Â that China will change its ways.